Statement: the series of introduction of cryoto exchanges is not for recommendation, but to provide all-sided investment perspective for investors. Binance started providing online trading services on July 14th 2017. But it was quite confusing that it only supported crypto to crypto trading. At that time, national digital currency exchanges all supported legal tender trading for convenience. However, Binance, as a new exchange, supported only pure crypto trading, which was not conducive to its user expansion. With the increasing popularity of blockchain concept, numerous blockchain projects sprang up and could easily raise more than tens of millions of dollars in an extremely short time. In the meantime, unlawful acts (e.g. illegal fundraising, fraud and pyramid scheme) also broke out. On September 4th, seven ministries (e.g. People’s Bank of China) announced a regulatory notice that initial coin offering shall be banned and all national exchanges be closed for a limited time. Thanks to Binance’s restriction on trading business, it survived. Since old users of other exchanges sought for new operational platform, Binance came as their first option and thus amassed users rapidly. According to released data, the number of Binance’s subscribers had reached 1 million to the date of December 8th 2017. International positioning and its only business of c trading were the cornerstone of Binance’s sharp rising. And management team’s precise positioning of Binance as well as its long-term insight into policy were also impressive. As blockchain market became hot again in December 2017, the number of Binance’s subscribers increased constantly and reached 5 million to the date of January 10th 2018. It meant that it developed 4 million new users within a month. Meanwhile, the total trading volume of Binance boosted enormously, steadily ranked top three and holding often the first place. This year, at the beginning of February, politically astute Binance offered to turn off China’s IP access, which triggered market tumble. Other Chinese exchanges also followed suite subsequently. In the beginning of March, user accounts of Binance were attacked by hackers, which brought about market plummet a second time. According to the official, hackers stole users’ API key, using their assets to buy beforehand top-up VIA at a high price. Nonetheless, as such unusual transactions triggered risk management of Binance, withdrawal services were suspended and loss event was thus prevented. In late March, since Binance started operating in Japan without registration, Japan financial services agency sounded a warning and requested it to stop all business operations in Japan. This event incurred market meltdown as well. Binance then cancelled its Japanese interface and declared that it would focus on Europe and Taiwan. Later on, Binance announced that it would develop Binance underlying public blockchain, planning to create a decentralised exchange. Market tumbles triggered by the occurrence of negative events aforesaid demonstrate Binance’s status and clout in this industry; besides during such events, Binance could always communicate with its users in time and take active measures. As for the reason of those events, whether it is due to Binance’s strength which attracts attacks or its own problems, we do not comment for the time being. Recently, after Binance declared that it would move its headquarters to Malta, it is now expanding global cooperation. 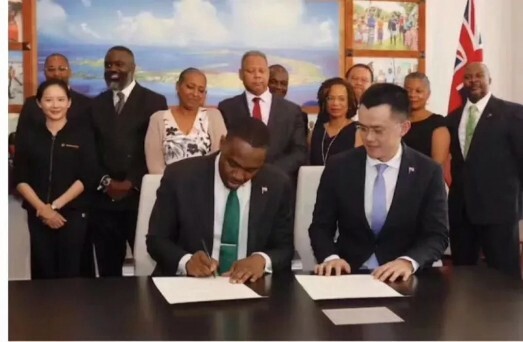 Up to now, it has already reached cooperation with the governments of Togo, Uganda and Bermuda etc. Whether Binance will successfully defend its leading position in this industry, only time will tell. Most Secure Exchange and Best Trading Engine? Binance exchange has many features: high-stability system, high-performance matchmaking engine technology, high liquidity, multi-platform coverage, multilingual support and rich currencies. On the premise of hundreds of thousands of users’ access and transactions each day, logging in and trading process still remains smooth and efficient; and it supports at present nine languages compared with only English and Chinese at the beginning; Supports for webend, ios and android are also rolled out. While Binance promote gradually its nternational operation, it keeps providing right products and smooth trading experience to users. Besides trading platform, Binance labs which is an incubator of blockchain projects focuses on seeking, discovering, incubating and supporting in many ways excellent projects. In addition, in its info section for crypto consulting, users can make enquiries into crypto introductions, white papers, official websites, blockchain browsers and various ways of socialising. Such section provides one-stop service to users. In the early stages, Binance strives to bring high-quality projects online as quickly as possible; meanwhile, it often organizes ranked matches of trading volume on an attempt to activate currency trading. Moreover, it rolls out coin entry free voting for users which promotes users’ sense of participation and boosts trading volume of online currencies. Top gun in coin circle, He Yi is in charge of Binance’s operation. Her performance in coin circle is there for all to see, which wins her confidence of investors. Every time when events or activities relating to Binance occur, she would show up in the telegram chat. Such in-time communication and full confidence establishment with investors are well worth learning by other exchanges and project executors. So how is the trading on Binance? 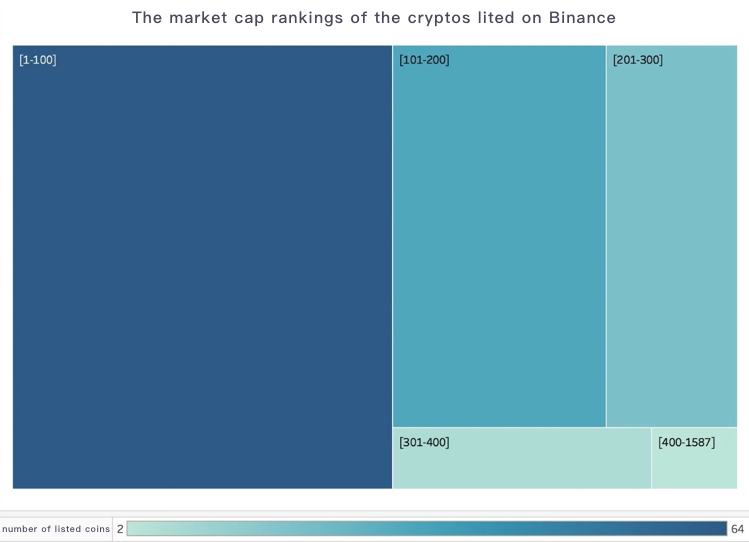 According to the figure, most online currencies of Binance ranked top 300 by circulation market value among which 64 roughly accounts for 50% of online currencies is ranked among top 100; the lower the ranking is, the smaller number of online currencies becomes. Next, we’ll analyse the trading volume from internal and external dimensions. In this dimension, we mainly count Binance’s top 10 currencies in terms of trading volume within 24 hours, calculating their proportion respectively to Binance’s total trading volume within 24 hours. These top 10 currencies are BTC, TRX, ETH, EOS, BCH, BNB, XRP, ADA, NEO and ICX, which proves that the 10 currencies are of high liquidity; among them, BTC and TRX boast the largest trading volume, accounting respectively for 15% of the total. Furthermore, the right side in the figure shows the 10 currencies’ proportion to accumulated trading volume. The sum of their trading volume makes up 66.69% of Binance’s total trading volume. 3. External Dimension Analysis of Trading VolumeIn this dimension, we focus on the proportion of online currencies’ trading volume in Binance to their total trading volume in all exchanges with 24 hours. 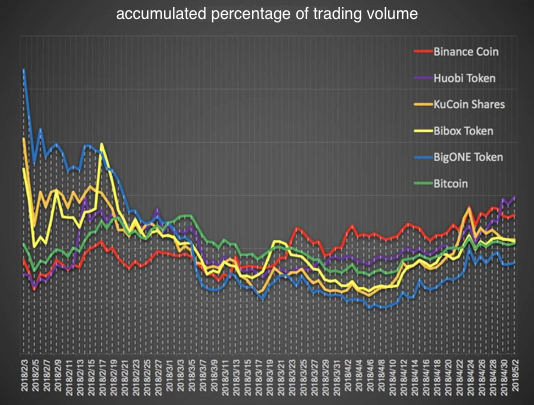 The following figure shows the statistical result of online currencies whose trading volume in Binance accounts for more than 80% of their total trading volume in all exchanges. According to the complete statistical result, we sectionally treat the proportion of online currencies’ trading volume to their total trading volume in all exchanges from 0–100% at intervals of 10%, calculating the number of online currencies in each interval. The figure below shows the summary result of our statistics. 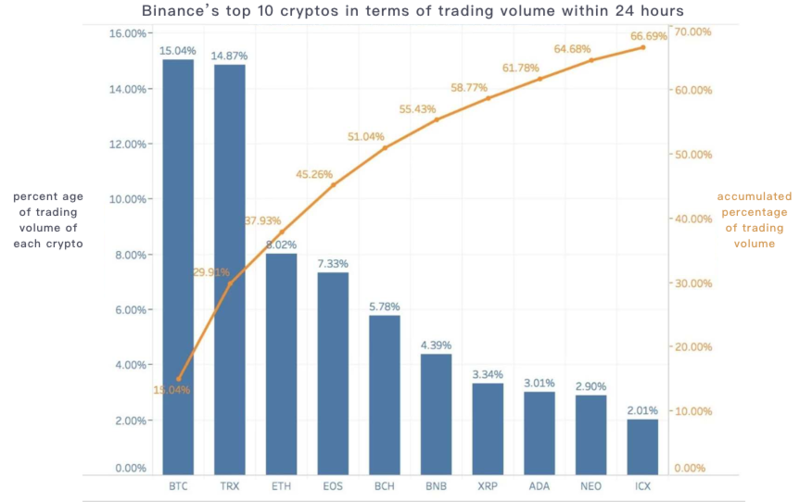 The figure shows that the proportion of online currencies’ trading volume in Binance to their total trading volume in all exchanges with 24 hours distributes evenly. Most currencies’s trading volume in Binance accounts for more than 10% of their total while that of over half of online currencies makes up more than 50% of their total trading volume in all exchanges. It demonstrates that all online currencies in Binance are of good liquidity. In light of the information above-mentioned, most listed. \ currencies of Binance are ranked in top 300 by circulation market value and with high proportion of trading volume in Binance to their total trading volume in all exchanges. At the same time, their high liquidity provides smooth trading experience to users. Therefore, the total trading volume of Binance is at the forefront of the industry. 1) Benchmarked against Bitcoin, we evaluate the change of Binance Coin’s (i.e. BNB) exchange rate to Bitcoin and less known currencies, judging BNB’s stability of market value by the rise (appreciation) or decrease (devaluation) of its exchange rate. On the basis of changing value, our evaluations of BNB in this dimension are as follows:In the figure above, from 3rd February to 3rd April, the price of BNB (the green line) at the end slighted rose compared with that at the beginning. 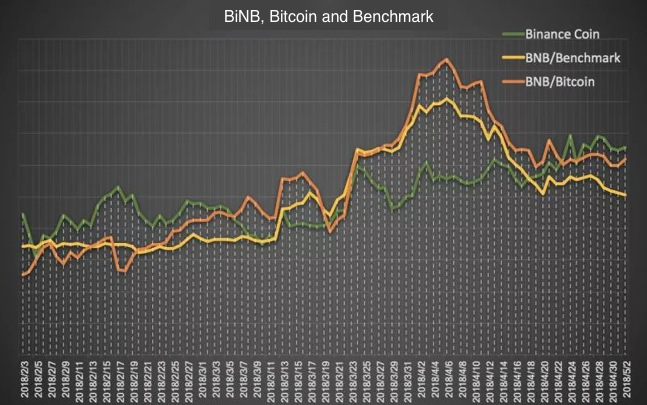 However, the exchange rate of BNB to Bitcoin (the orange line) and of BNB to Benchmark (the yellow line) rose markedly, which demonstrated that in the overall market decline during the 2-months period, BNB substantially outperformed Bitcoin and Benchmark. From 3rd April to 2nd May, BNB’s price (the green line) remains rising slightly while its exchange rate to Bitcoin (the orange line) and to Benchmark (the yellow line) dramatically dropped. It showed that when the market was on the rise, the appreciation rate of BNB underperformed Bitcoin and Benchmark. On the basis of their respective amount of increase and amplitude in 3 months with analysis of per unit risk to benefit ratio, we evaluate the performance of currencies’ market value. This ratio shows the return rate of investment target taking per unit risk. The higher the ratio is, the higher return rate becomes when investment target takes the same risk. According to the table, the return rate of Binance Coin is ranked the second in recent 3 months; and its low price volatility holds the fifth place with stable and sharp rising trend. As for risk to benefit ratio, it is ranked the second. In its competing products, it narrowly underperforms Huobi Token, but markedly outperforms KuCoin Shares, Bibox Token and BigONE Token; Compared with Bitcoin, the per unit risk to benefit ratio of Binance Coin is obviously larger. 1) According to white paper of Binance, the capital for buy-back is 20% of its net margin. As the capital for buy-back in the third quarter is about 30 million USD, we can infer that its gross profit in this quarter is 150 million USD; despite the market decline and the decrease of transaction costs from January to March this year, Binance gained still huge profits. The following table shows the buy-back of Binance in three quarters. Buy-back volume rose gradually quarter by quarter while the proportion of buy-back volume to turnover rose steadily. This also effectively promotes the value of Binance Coin. 2) Exchanges claim that constant buy-back will propel the appreciation of token. Therefore, we can determine token’s speed of appreciation by calculating its buy-back volume. Comparing Binance’s buy-back with that of other exchanges in the first quarter of 2018 and calculating respectively their proportion of buy-back volume to turnover, we can see in the table that BNB’s buck-back proportion is ranked the second and its buy-back volume is relatively good. Note: unit price of buy-back is selected from US dollar’s price at 12 o’clock the day before exchange’s release of buy-back announcement; in addition, only buy-back volume in secondary market is counted in the calculation of HT’s buy-back by Huobipro. Binance knows how to seize opportunities and provides excellent products. And with the aid of powerful and efficient operation, it rises rapidly. Most of its online currencies are among top 300 by circulation market value and with good liquidity. Besides, BNB’s buy-back volume increases along with its growth of trading volume; in addition, BNB performs rather well in terms of risk return compared with similar currencies. [DPRating] What are some Quality ICOs to invest in May? [DarpalRating] Which exchange has the best new coins since January? Aiming to become the "Moody's" in the digital currency sector. At present, our content includes blockchain reviews, interviews and auditing.